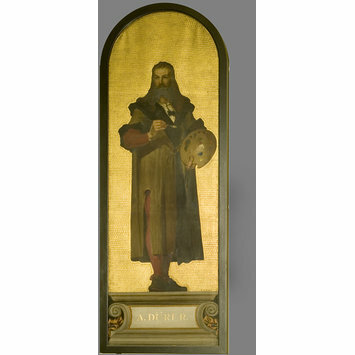 Full-length portrait of Albrecht Dürer, beared with shoulder-length hair he holds a paintbrush and an artist's palette. Historical significance: Albrecht Dürer (1471-1528) has come to be seen as the archetypal Renaissance artist of Northern Europe, celebrated for his remarkable powers of observation and his ability to render exact and meticulous detail in his studies from the life. A man of great intellectual curiosity, he was deeply interested in the science of proportion and perspective. He visited Italy, where he was influenced by Mantegna, Leonardo and Giovanni Bellini. His prints in turn influenced Italian artists. The portrait derives from prints after Dürer's famous self-portrait at the age of 28 (Alte Pinakothek, Munich), although Fisk has introduced a subtle contraposto, turning the artist's head slightly to one side as he holds a palette and paintbrush, as though he is in the act of observing the subject of his painting. William Cave Thomas also produced a portrait of Dürer for the Valhalla series; however, for some reason neither Cave's nor Fisk's designs were converted into mosaic.